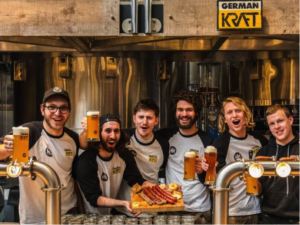 German Kraft is hosting the first Kraft Beer Oktoberfest in London this weekend, serving exceptional tasting beer brewed with never-before-seen distilled water technology. The Kraft Beer Oktoberfest will take place from 21-23 September at Mercato Metropolitano in the urban beer garden with four local breweries serving 16 different craft Oktoberfest beers in 1L Steins. German Kraft is pioneering the way in which beer is brewed in London by fusing traditional 400-year old recipes together with a modern water-distillation process to purify water before beer is brewed, which is sustainably powered through waste heat from the brewing process. After the water has been purified various minerals are added to the water to customise the perfect brewing water for each beer type. German Kraft and their Braumeister take brewing seriously with their traditional German-style approach to creating the perfect brew. Speciality hops and malts are sourced from Germany and milled on site resulting in a well-balanced, unfiltered, unpasteurized, and preservative-free taste. In true Franconian fashion, serving beer fresh from the source to locals straight from the tank. The Oktoberfest weekend will have everything that customers love about the traditional beer festival, including live German music, Scheinshaxen, würste and the most important of all, Steins full of beer. German Kraft have also invited three microbreweries along for the Oktoberfest weekend, with Gipsy Hill, Anspach & Hobday and Mondo Brewery pouring their beers during the weekend. Tickets for the Oktoberfest weekend can be purchased through http://bit.ly/kraftoktoberfest. The German Kraft brewery is located at Mercato Metropolitano at 42 Newington Causeway, Elephant & Castle, SE1 6DR.